When poults are received at a farm from the hatchery they should be good quality poults; namely, free from physical defects, actively looking for feed and water, able to respond to changes in temperature and generally exhibit normal behaviour. In addition, they should be free from pathogenic organisms that can result in disease or poor performance and also free from potentially zoonotic infections such as salmonella. However, poults will never be sterile. The poult is hatched from an egg which was laid via the cloaca of the hen. The cloaca has a huge microbial population (~109 bacteria per gram of faeces) to which the egg is exposed when it is being laid. This microbial population will normally include Clostridia, Lactobacilli, Bacteriodes, Enterococci, E. coli, and Streptococci etc. The egg surface will be heavily contaminated with these organisms and, despite the egg sanitation procedures that occur at the breeder farm and or the hatchery some of these bacteria will persist through to the hatching stage where they will contribute to the formation of the gut flora of the newly hatched poults. Hatchery hygiene procedures are designed to minimise the level of bacteria present in the hatchery however they will not eliminate them entirely. What organisms shouldn’t be present in poults delivered by the hatchery? Some organisms should not be present at any level in the poults leaving the hatchery. These include Avian Influenza virus (AI), the avian pathogenic mycoplasmas (M. gallisepticum, M. synoviae, M. meleagridis and M. iowae) and salmonellas, particularly those that are primary avian pathogens or are of human health significance. Most of these are covered by Intracommunity trade legislation1, which requires turkey breeder flocks to be free from Notifiable AI & ND, S. pullorum/gallinarum, S. arizonae, Mg and Mm. Other salmonella serotypes are being targeted by at the National level as prescribed by the EU2. Additionally it is usual to expect the poults to be from breeder flocks that are free from Ms, Mi and Reticuloendotheliosis virus. The warm and humid hatchery environment provides ideal conditions for the survival of a number of environmental organisms aside from those that are part of the normal flora of the hen. These include Pseudomonas sp and Aspergillus fumigatus. These organisms can enter the hatchery on the eggs from the farm environment or via a number of other routes from the external environment. The modern hatchery sanitation programmes are designed to keep these and other potentially infectious organisms under control but they are very unlikely to eliminate them entirely. The aim of the hatchery sanitation procedures should be to limit the exposure of the eggs to these organisms in order to prevent the contamination of the developing embryo or newly hatched poult. High levels of challenge can result in problems due to infection of the embryo within the egg or to an overwhelming challenge at hatch. All of these organisms are opportunistic pathogens and can cause clinical disease if the levels are not controlled. During hatching and processing, the poults will be exposed to those bacteria which have survived in or on the egg despite the egg sanitation procedures. These are likely to include those bacteria that make up the “normal” flora of the breeder hen namely Clostridia, Lactobacilli, Bacteriodes, Enterococci, E.coli, Staphylococci and Streptococci etc. In addition to the normal egg flora the poults will also be exposed to the environmental organisms in the hatchery that survive the hatchery sanitation procedures – these can include Pseudomonas sp and Aspergillus fumigatus. The detection of low levels of these organisms in healthy poults at delivery is not an immediate cause for concern. The poults are also likely to be exposed to these organisms on arrival at the farm, as they are likely to form part of the environmental flora that exists on any poultry site. 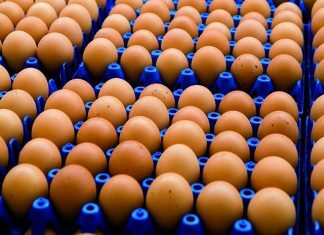 Transmission of infection from the breeder farm: This can occur due to the true vertical transmission of poultry pathogens in the egg such as Mycoplasmas and Salmonellas etc, or through contamination of the egg shell on the farm e.g. Salmonellas. 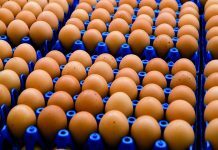 In addition high level contamination of the eggs on the breeder farm due to poor management practices can result in contamination of the eggs with environmental organisms such as Aspergillus and Pseudomonas (often due to problems with egg sanitation) etc. The use of these eggs can result in increased risk of overwhelming challenge at hatching leading to clinical disease. Many organisms which are part of the “normal” flora can act as opportunistic pathogens if they are given the chance. This can occur if contaminated eggs (e.g. floor eggs) are incubated leading to high levels of bacteria being present which can then overwhelm the poult at hatching resulting in clinical diseases such as omphalitis, yolk sac infection or bacterial septicaemia. The Hatchery: The hatchery can act as the source of challenge by a variety of micro-organisms during incubation/hatching if inadequate management, maintenance and disinfection procedures are in place for the reasons described above. Excellent hygiene is required if interventions such as in-ovo vaccination, toe trimming, beak trimming and de-snooding are carried out at the hatchery as these provide a break in the poults defences through which bacteria can pass e.g. Staphylococcus aureus. As described above there are a number of organisms which should not be present at all in poults delivered to a site from a hatchery and others which are likely to be present as part of the “normal” flora. 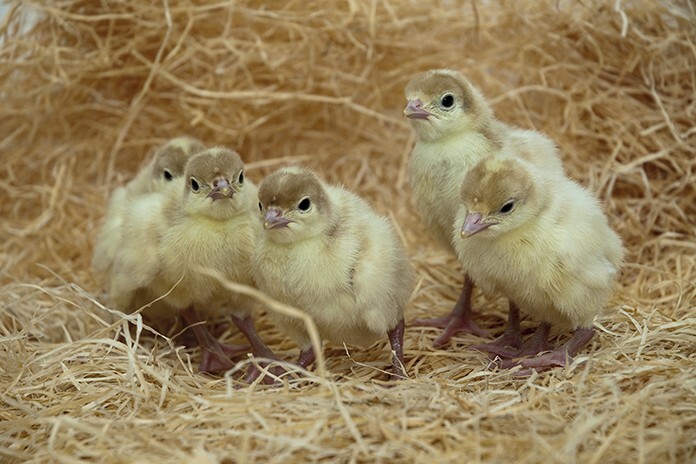 Any sampling strategy for testing day old poults should be determined by the type of organism, the route of infection and the likely transmission rate. Salmonella: Sampling the poult transport materials (e.g. poult box liners) can provide a good composite sample to determine the status of the poults being received. To maintain the confidence of both the breeder and the farmer, this sample is best taken on the delivery vehicle before the boxes in question enter the house. It has been shown that boxes/poults can become contaminated in the first few minutes on a farm that has not been adequately cleaned and disinfected. Mycoplasmas: The best protection against receiving poults infected with Mycoplasma is to source the poults from a reputable hatchery that guarantees freedom from infection. Testing at day old is very unreliable for a number of reasons. Serological tests are very prone to false positive reactions; PCR and culture are highly unlikely to detect the presence of any mycoplasmas given the low transmission rate, number of source flocks and very small sample size usually involved. Farmers/companies that source flocks from a number of different hatcheries frequently carry out testing at placement. In these circumstances it is very important that the limitations of the testing regimes and the tests themselves are understood by their veterinary advisors and that all “positive” results are confirmed by follow up testing. “Normal” flora: Poults received from any hatchery will have been exposed to some bacteria for the reasons outlined above. Poults placed in a well prepared clean brooder house with access to clean feed and water will go on to develop healthy gut flora including these organisms. The presence of these bacteria at delivery is not a cause for concern, or for the use of antibiotics, unless it is linked to clinical disease in a significant number of poults in the first few days of life. This will usually take the form of omphalitis, yolk sac infection or bacterial septicaemia as described above. On occasion, particularly after interventions at the hatchery such as toe trimming etc, problems due to low grade infections with organisms such as Enterococci or Staph. aureus can become apparent later in life in the form of leg problems etc. Post mortems: Monitoring mortality and responding rapidly to unusual or increased mortality is an extremely effective way of determining if hatchery related infections are occurring and allow for early appropriate intervention if it is required. In many cases of yolk sac infection and or omphalitis treatment with antibiotics is largely ineffective and may not be required. The affected poults die in the first few days and should be rapidly removed. Where possible antibiotic sensitivity testing should be carried out to help determine what antibiotics are effective. The practice of culling and testing day old poults occurs regularly in some markets and not at all in others. 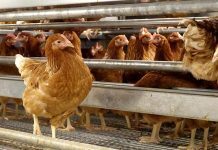 It tends to occur in those markets where independent farmer’s source poults from a number of hatcheries, who may in turn have sourced eggs from a number of companies. As described above, testing for salmonella is very straightforward and effective. Testing for Mycoplasmas is more problematic and the difficulties of interpreting the results and the lack of sensitivity need to be considered. It is important that positive results for either Salmonella or Mycoplasmas are confirmed – the sampling process needs to be carefully carried out and a laboratory with good quality control systems should be used. This will help avoid unnecessary conflict between the farmer and the hatcheries and will help generate a relationship. Overall the decision to carry out testing to determine the microbiological status of poults and how the results are used needs to be based on good science, otherwise, the procedure is largely ineffective and simply another cost. 2Regulation (EC) No 2160/2003 on the control of salmonella and other specified food-borne zoonotic agents. 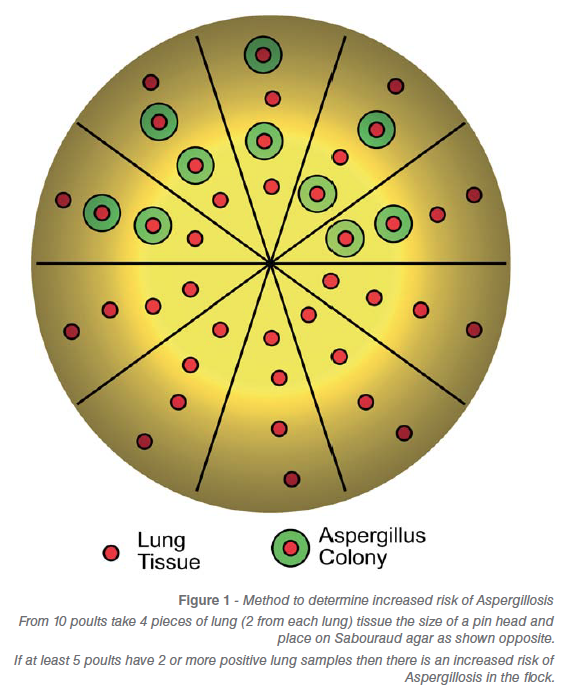 3Hamet.N – Prophylaxis of Aspergillosis in industrial poultry breeding units. Point Vet., 1990, 22, no 127, April 1990.